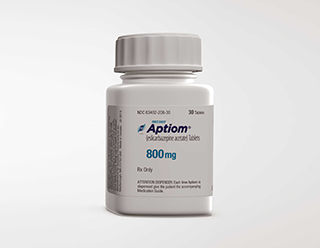 Sunovion announced that Aptiom (eslicarbazepine acetate) is now available for use as adjunctive treatment of partial-onset seizures. Aptiom was approved by the FDA on November 8, 2013. Aptiom, a voltage-gated sodium channel inhibitor, is converted to eslicarbazepine. The precise mechanism by which eslicarbazepine exerts anticonvulsant activity is unknown but is thought to involve inhibition of voltage-gated sodium channels. Aptiom is available in 200mg and 400mg strength tablets in 30-count bottles; 600mg strength tablets in 60- and 90-count bottles; and 800mg strength tablets in 30- and 90-count bottles. For more information call (888) 394-7377 or visit Aptiom.com.